A friend of mine what's-apped(if that's not a real word yet it will be soon) me a few days back, saying "Hey, how come you aren't writing anything nowadays! " And I said hey, that's 'coz I've been reading this huge history book! As you can see from the picture, its more of a tome than a book. Considering that I only get to read while traveling in the trains, you can understand what took me so long. As my youngest brother said, Nelson Mandela's 'Long walk to freedom' is more like the long 'read' to freedom. A great book it was and is. Mandela has compiled his memoirs with the care that a master craftsman might devote to his work. His strength of character, clear and accurate memory and strong command of the written medium, allow his ideals and his prose to dovetail nicely into a seamless recollection. His writing enthralled me from the first chapter, and stirred in me revolutionary thoughts and ideas I didn't think I was capable of having. For example, it was while reading this book that I took up an initiative to demand more dustbins for the colony I live in (This may be just a coincidence, but then, I don't believe in them). Mandela describes his upbringing, and how with age and exposure, the injustices the African people suffered slowly became more and more apparent. The imbalance of power prevalent in South Africa rankled him, and along with many educated African youth of his generation, realised that the wrong that was apartheid must be righted. He wrote of "..the sense power that comes with having right and justice on one's side." The struggle for equal rights defined him as a man. I was touched by his all consuming commitment, and awed by his logical and open mind. His cool and systematic manner, and professional training as a lawyer, rendered him an able debater and a visionary thinker. It was inspiring to see how holistic and inclusive his ideology always was, always looking for the common ground and while dealing with other people and organisations. His choices led him to sacrifice his time with family, livelihood and eventually, his freedom. After forsaking his legal practice and living the life of an outlaw for a considerable period, he was finally imprisoned, and thus began the darkest years of his life. The names Nelson Mandela and Robben Island are almost as synonymous as Nelson Mandela and South Africa. Robben Island, the prison where he spent much of his 27 years of incarceration, was supposed to break his spirit, and that of his comrades. But, united with his fellow prisoners, he prevailed. Not only did he prevail, but he continued to oppose the system from within and held the same ideal of equal rights just as high, even though no one on the outside could see. For me, that was the defining moment in this book. To stand strong in the face of oppression while your people and the world are watching requires courage, but to stand just as strong when they cannot see you, requires infinite inner belief. He writes, "The campaign to improve conditions in prison was part of the apartheid struggle. It was, in that sense, all the same; we fought injustice wherever we found it, no matter how large or how small, and we fought injustice to preserve our own humanity." It was astounding how he held on to not just his own humanity, but also to the belief in the humanity of his oppressors as well. He always asserted, that the oppressive system was the real enemy, and given an opportunity, the goodness in a man would always rise above the chains that bind and blind his heart. All through this post I have tried my best to reproduce the strengths, solidarity and successes of this man's life. But there are greater pictures of pain, loneliness, and darkness painted through words on the pages of this book. None pained me more than the personal sacrifices that he had to make. Being a leader and freedom fighter meant it was difficult for him to fulfill the obligations he owed his family. He writes, "In South Africa, a man who tried to fulfill his duty to his people was inevitably ripped from his family and his home and forced to live a life apart, a twilight existence of secrecy and rebellion." In short, the book is an epic. It cannot be anything else, because the lives that Nelson Mandela, and so many freedom fighters, have lived, are incredible. 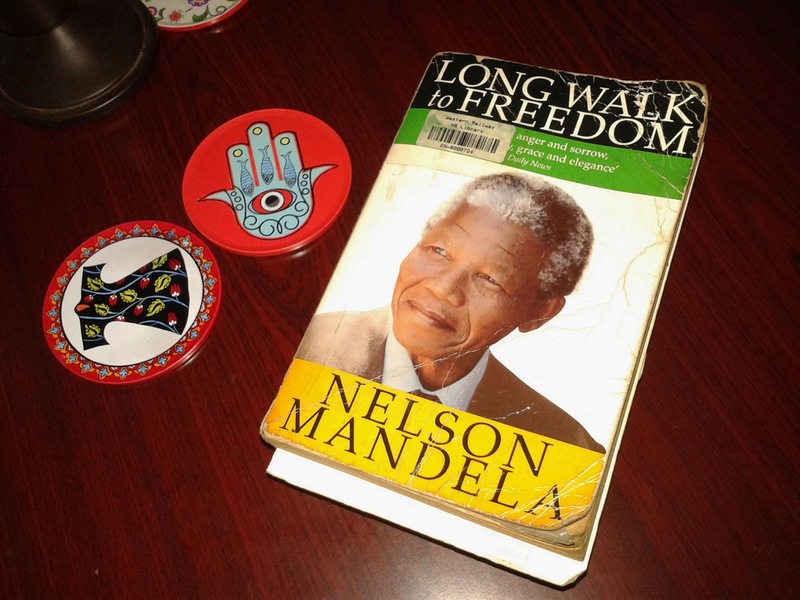 Simply put, if you are a fan, nay, an admirer of Nelson Mandela, you must own this book. If you are not, you must read this book. There is no way you cannot be one at the end of it.